Preheat oven to 400 degrees. In a medium bowl, warm cream cheese in microwave for about a minute to soften. 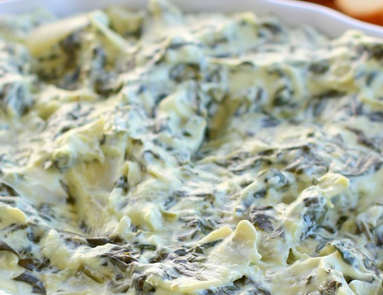 Add spinach, artichokes, sour cream, mayonnaise, and Parmesan. Mix all together and add garlic salt. Place in an oven safe dish and bake in the oven at for about 20 minutes. If using fresh spinach, bake it for about 20 minutes, stir, and bake for an additional 10 minutes if needed. Serve with your favorite crackers, bread, chips or vegetables.